This kind of dedication and willingness to always go above and beyond deserve more than a thank-you card or plaque, said former UCAPP student Hannah Ruede, which is why she and the 12 other UCAPP East 21 cohort members who graduated in May established the Earle G Bidwell Educational Leadership Scholarship. The scholarship provides $500 to a graduate student enrolled in one of the Neag School of Education’s Educational Leadership programs who show both academic achievement and financial need. Priority is given to students enrolled in the rigorous, two-year UCAPP program that provides students with not just classroom and curriculum laboratory learning, but 90-hours-per-semester internships with a mentor administrator. Like Ruede, more than 80 percent of those who’ve completed UCAPP give it an “A” for the professional learning, growth, management skills, collaboration tools and intellectual introspection they received from instructors like Bidwell. “His titles are ‘supervisor’ and ‘advisor,’ but he provides students with so much more than what those titles define. He’s supportive, compassionate, there whenever you need him, and brings a wealth of information and experience,” said Ruede, an alternative education and science teacher at Windsor High School who is still deciding how she wants to use the Sixth-Year Diploma and Connecticut State Certification as Intermediate Administrators (CT-092) she achieved from her UCAPP experience. 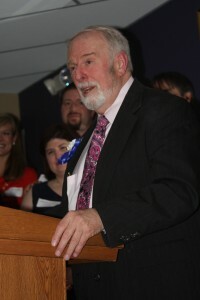 Bidwell said he can’t think of many things more rewarding than the work he does with UCAPP or as assistant executive director of the Connecticut Association of Schools (CAS). Both jobs require him to use his close to 50 years in education to help current and emerging administrators inspire and lead, as well as to identify and provide needed supports and services. “The ability to work with and influence administrators is such a privilege because it’s such important work,” said Bidwell, who started his career in 1964 as a music teacher. After receiving both his master’s and Sixth-Year Diploma from UConn, he spent five years as a high school assistant principal and 19 years as a middle school principal. He’s also a former CAS president. News that the UCAPP Class of 2012 cohort had created the Earle G Bidwell Educational Leadership Scholarship left him speechless, he said. The first $500 Earle G Bidwell Educational Leadership Scholarship was awarded this past April to current East 23 cohort member Jennifer Geragotelis. Ruede said the goal of the cohort who started the scholarship is to eventually increase the amount given, but, first, an additional $3,000 to officially endow the scholarship needs to be raised. Fund-raisers organized by Ruede and her cohort helped raise the $7,000 that currently sits in the Bidwell scholarship account, but for the scholarship to become permanently endowed, it needs to be at $10,000. For more information on, including how to contribute to, the Earle G. Bidwell Educational Leadership Scholarship, contact Heather McDonald at hmcdonald foundation uconn edu or (860) 486-4530.